OK, not quite Friday? Ironically, my blog turned 10 years old right around when I clammed up in February. I was working on an epic, thoughtful, all encompassing post...but, um, yeah. To sum up--- yay, blogging! Meanwhile, I've been up to many things. Including knitting. Here's my Audrey cardigan, debuting during lunch with Beverly Army Williams a few weeks ago. 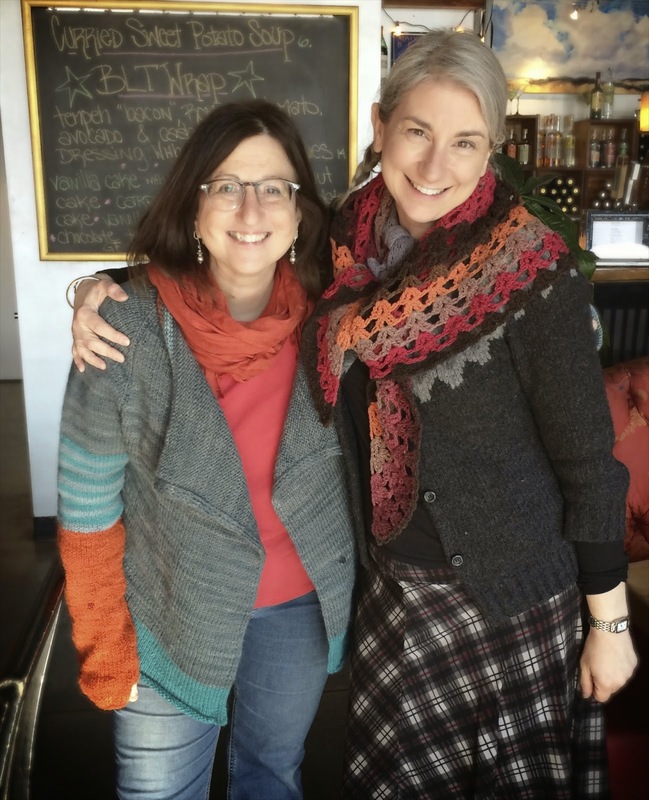 We met to plan course proposals for Fiber College *,in Searsport Maine, we'll be co-teaching again come September 9-13th. Class registration launches April 1st. - yes, it was really cold, all the layers you see were not nearly enough, and that's inside the restaurant. 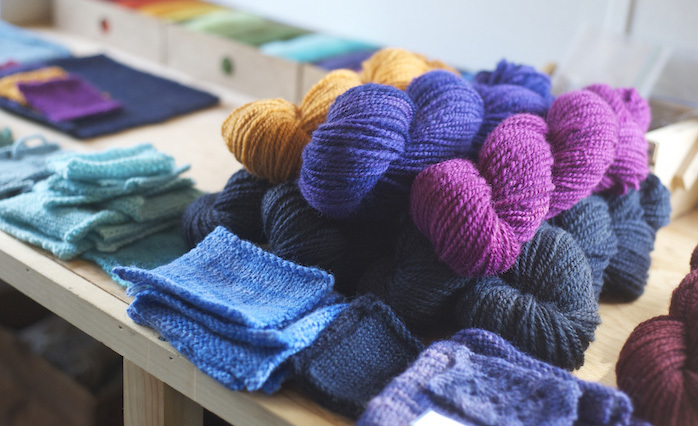 Let's just say it has been an excellent winter and spring for wool lovers around here. - Beverly is wearing her Wingfeathers shawl, in JillMakesStuff Rifton. Rather fab, isn't it? I adore my sweater, loving it right from the cast on with Starcroft Nash Light yarn , a perfect wooly, soft, bouncy yarn. Plus the realization that I know exactly where the wool grew. 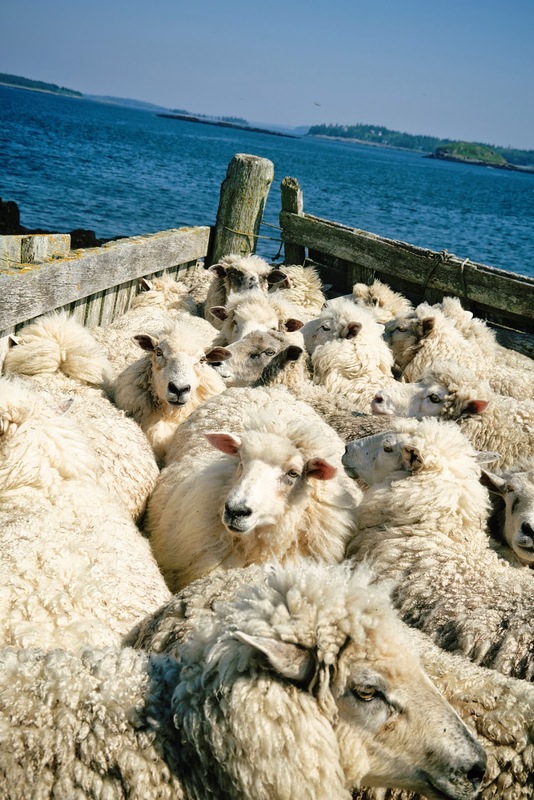 Nash Island sheep! I accumulated the skeins a few at a time over the last couple of years- you can see me clutching some halfway down in my blogpost here from the first time I helped with roundup and shearing day on the island. I made it a little more over sized than it needs to be, but no matter, it's a favorite and brightened my winter wardrobe-. Psychologically, too. The color blocking was changed from the pattern as written, to suit myself- both my shape and my quantities of various colors. This is what I love about making my own clothes. Changing it up as I wish, or spontaneously. I know there's also the camp that wants to make a sweater to exactly match the sample..but I am almost never happy there. As you can see, I AM happy here. The pattern is a yarn gobbler...if you think about it, the front is double layered. It's knit top down, in one piece, with faux seams. When I got to the the sleeves, I'd planned the Lobster (truly great colorway name) lower arm but didn't have enough of the main body (Cove) color, so improvised the striped section between the two. I'm very happy with it. You'll notice I ran out of Lobster before I came to the knuckles on my left hand too. I like to think it looks intentional. Humor me! 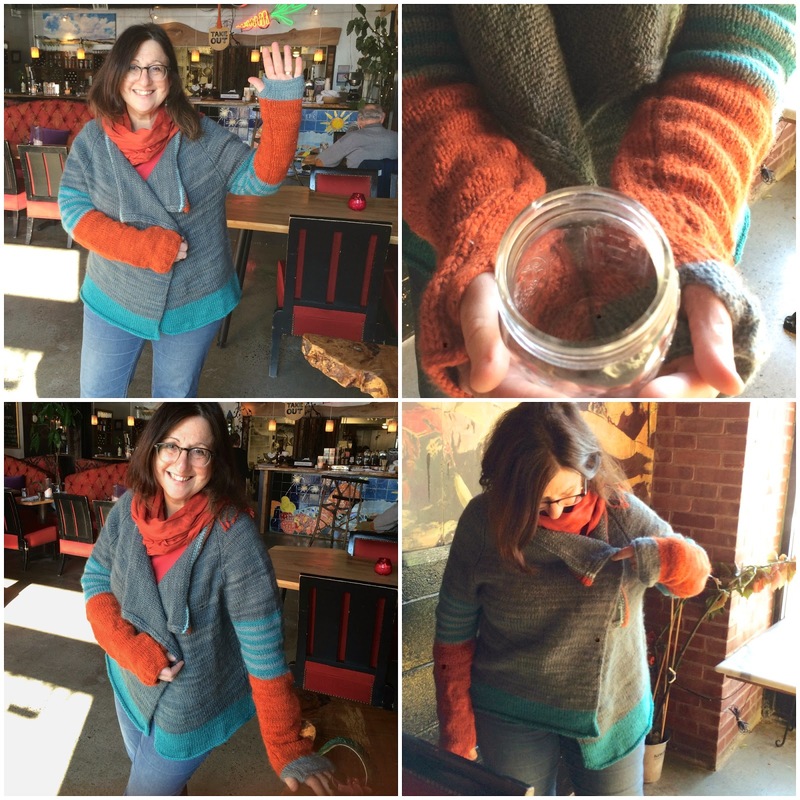 One of my favorite features is the extra long sleeves with thumb holes-- like built -in fingerless mitts. First time I've made a sweater with them, won't be the last. I couldn't decide on a front closure, or where I'd place it, so I left it open. If you look at the projects page, which I assure you I did a gazillion-millionty times, there are many options. Sometimes I just let it fall open, like in the image with Beverly, and sometimes I pin it shut. Or, I guess, hold it, in a weird and awkward way. And that in the upper right? If you have taken a workshop with me, you know I disparage (OK, outright mock) cliche poses, especially hands cupped clutching something. It's so overdone, and in any case, whatever is in the hands inevitably becomes the focal point of the photo when it should be about the knits. I especially poke fun at the use of empty mugs. Extra pokes if the model is in some deep woods or natural setting with empty tableware. Beverly, who kindly photographed me, couldn't resist. So, there you have it. * Fiber College is an inspirational fiber arts retreat in the most beautiful setting. Unique vibe, fabulous teachers and a certain something special happens every single year. I am already looking forward to it!